There are several train providers across the UK & Europe. By searching for your ticket using our travel search engine, you will be able to see the trains connecting Edinburgh in Scotland to Paris in France as well as the train operator for this journey. 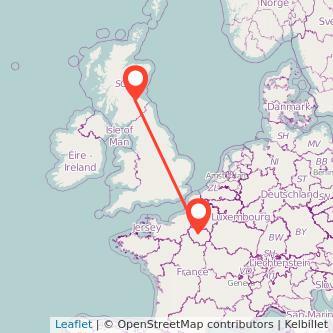 There are 543 miles between both cities and the average train duration connecting Edinburgh to Paris is normally 9h14m. Travelling by train is normally the quickest solution to go to Paris from Edinburgh, and it's also more environmentally friendly than taking your car or using the plane. We found tickets from £82.50 to travel in the next month. Prices can vary depending on when you travel or how long in advance you buy your ticket. Find the cheapest tickets to travel from Edinburgh to Paris by train, bus, ride sharing and plane. The Prices for train tickets Edinburgh to Paris are increasing the closer you get to your departure day. According to our data, if you buy your train 15 days in advance, you can find tickets from £118 whereas when purchasing your seat on the day you're travelling, you will need to spend at least £225 for your train. Thus, you may save 48% on the price of your ticket by booking 15 days in advance instead of on the day you're travelling. The figures are based on the best fares found over the past 6 months when buying in advance versus at the last minute. We compare train ticket for all major companies to travel between Edinburgh and Paris by train and find the best prices for the coming days. Take a look at the prices of train tickets Paris to Edinburgh and find the best deal for your outbound journey.